Mushroom duxelles (pronounced dook-SEHL) is a French recipe made from chopped mushrooms (or stems), shallots, and herbs sautéed in butter. The mixture is then reduced to a paste and used in sauces and stuffings. You may sometimes see it written as "duxelle", the confusion probably due to the fact that the final s is silent. Allowing all the liquids to evaporate is the secret to delicious duxelles. This concentrates the mushroom flavors into a savory paste or cream that can be stored in the freezer for up to 2 months. Any mushroom can be used to make duxelles, although the more flavorful ones will work best. If you choose to wash fresh specimens or reconstitute dried ones, make sure you pat or squeeze them dry. We will be cooking off all liquids so the less water in the recipe to begin with the better. I like to work with the measurements in the recipe below. Feel free to adjust the amounts as you see fit. Heat butter in a skillet over medium-high heat. After butter melts add shallots and garlic and sauté for 3 minutes. Add chopped, dry mushroom pieces, salt/pepper, and herbs. Reduce the heat to medium or medium-low and simmer until all liquids have evaporated. Unlike a typical mushroom sauté, this will take a little longer (10 to 12 minutes). 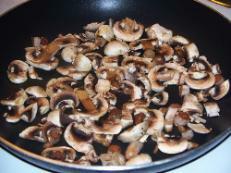 Also try to avoid browning the mushrooms. Add white wine and cook until evaporated, usually around 4-5 minutes. The final result should be a paste or "mash" consistency. Remove from heat and add to your favorite recipe. Mushroom duxelles can be use with beef wellington, fish, mussels, pasta sauce, lasagna, eggs, or topped on pieces of toasted baguette. Baking the pre-made paste into a puff pastry is also great for appetizers or a main course. Substitute olive oil for butter to make a vegetarian recipe. Use soy sauce in place of, or in addition to, white wine. Lemon juice or dried fruit are other common additions.